The temple of Hagar Qin is unique architectural masterpiece, given the limited resources available to their builders. 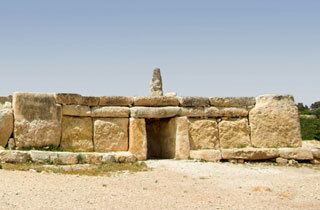 The Ta'Hagrat complexe shows how the tradition of temple-building was handed down in Malta. This article uses material from UNESCO World Heritage List article "Hagar Qim", which is released under the Creative Commons Attribution-Share-Alike 3.0 IGO License.